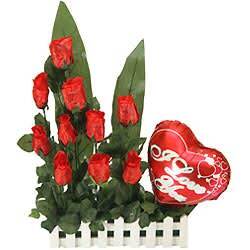 Online delivery of best wishes along with this Mesmerizing Precious Love Gift Arrangement for your dear ones. This Gift Arrangement is accompanied with Imported Silk/Art. 10 Red Roses and a Heart Shaped I Live You Mylar Balloon. You can wash the Flowers.